Portland State's website had a great preview article, so let's take a look at it. If you are interested in learning about the Vikings I encourage you to read it all, it is nice and thorough. Odum, a 6-foot guard, averaged a team-high 14.0 points, 3.4 rebounds and 2.8 assists while shooting .524 from the field. Those numbers improved to 15.3, 3.7, 2.9 and .565 in league games, earning him second team All-Big Sky Conference. Odum is the star of the backcourt, and he could be a first team Conference player this season. 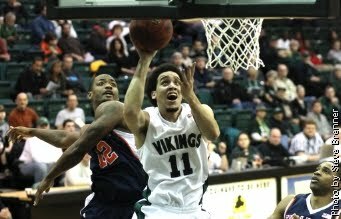 He was a very efficient scorer and solid distributor in his first year for the Vikings. If he can improve his ballhandling and outside shoot a bit, we will be talking about him with Damian Lillard and Will Cherry as the top guards in the Big Sky. Tapscott is a good shooter inside and out and also gets to the free throw line with regularity. “Chehales has a chance to be All-Conference this year. We went 1-5 without him (while injured), so you could make a case that he was our best player last season,” said Geving. I have written quite a bit about Chehales Tapscott on this site, and think he could be the best post man in the Conference, even if he is not really a true post (at 6'5''). He is the leading rebounder in the Conference, and I think he will be first-team Big Sky. Look for him to become a household name, as he can score in a variety of ways. Harthun is a 6-3 transfer from Washington State who will ably step into a perimeter shooter role. Although he never got his career going at WSU, Harthun is a proven scorer and winner. As a senior at South Medford (OR) High School, he averaged 21.0 points and six assists per game. He was a three-time All-Conference and All-State performer, scoring 1,949 points as a four-year starter, which ranks second in school history behind former teammate Kyle Singler, who is now in the NBA. Harthun will be particularly valuable due to the graduation of shooters Melvin Jones and Phil Nelson. Michael Harthun has a lot of talent but didn't produce much in his last stop. He's got the ability to be a difference maker for the Vikings if he used the redshirt year to his advantage. His development will be a key factor for them. The third returning redshirt is 6-10 center Brandon Cataldo. After missing his senior season of high school with a broken leg, Cataldo needed a year to recover and improve his conditioning. However, in that redshirt year he proved to be a very skilled big man, with good footwork, good hands, passing and shooting ability. If he continues to progress and improve his conditioning, Cataldo will form an excellent big-man tandem with Lozeau. I think Cataldo could be a big-time talent for Portland State, and a guy not many fans knowing going into the season. He is very skilled and polished as the article says, and if he can stay in shape and stay healthy he could be huge for the Vikings. Watch for Cataldo this year. First and foremost, Geving cited the need for a pure point guard, and believes he got his man with junior transfer Lateef McMullan. “I feel really good about the point guard spot. We got a real competitor. A tough kid who is a winner. He's also played Division I basketball before. I have been hearing lots of raving about McMullan, who averaged about 16 PPG and 4 APG last season. He also has Divison I experience, as he played his freshman year at UC Riverside. There is a lot more good info on incoming recruits in the article, and more on all of the players, including a lot of good quotes from Coach Tyler Geving. I have picked them third in the Big Sky this year, because I think the nucleus of Odum and Tapscott will be complemented well by guys like Harthun, Cataldo, and McMullan. If nothing else, Portland State should be fun to watch, because they will probably again lead the Big Sky in scoring.